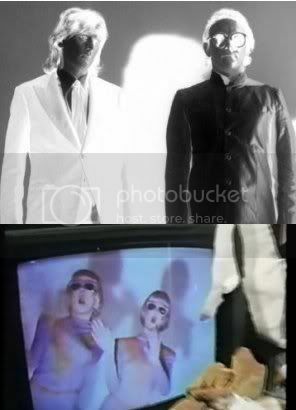 Video Killed the Radio Star is a ‘classic’ notable as much for announcing the dawn of the 80s as for its electro-pop then-novelty. The first video to be shown on MTV, it was somehow both arch, ironic commentator on that decade’s follies and triumphs and soul-squashing spawn of Satan responsible for the death of imagination. So (The) Buggles lay claim to a peculiar role in history. With the world at their feet, Trevor Horn and Geoff Downes let Buggles lie fallow and joined, of all people, prog-rock giants Yes, rebooting them with mixed results. With that achieved, Horn recorded a second Buggles album (Downes left to form Asia), and that commercial flop is now available on CD for the first time, with ten seriously interesting bonus tracks. After this, Horn accepted that his talents lay in producing rather than fronting, and went on to define the decade with ABC, Frankie Goes to Hollywood, Malcolm McLaren et al. He nurtures top-level names, and also Robbie Williams, to this day. The title says it all: Horn is more intrigued by the possibilities of the studio than the song. It sounds paltry and tinny in places, his experiments now dated. In other sections, his courage remains audible and impressive, as tracks skitter from pompous sampled dramatics to wonderfully impish mock-jazz sections. There’s a hyperactive mind at work, but this is where he worked out his kinks, honed his mad skills. There’s dazzling range to Vermillion Sands which makes Bohemian Rhapsody resemble T.V. Eye, while Beatnik and On TV take the bustling 1970s brains of 10cc and use them as Play-Doh for Horn’s desk of tricks. Schizophrenia rules: he was to re-mould Videotheque for his puppets Dollar, while We Can Fly From Here was first written for Yes. The vocals are weedy (next to Horn, a robot is Aretha), but that just adds to the intentional Ballard-ian froideur. This brand of Buggles sound(ed) both mischievous and stately, inquisitive yet portentous. Buggles were just one finger on Trevor Horn’s wizard-hands. He learned warmth, and became chief enabler for some peerlessly smart pop. This is his sketch-book. Trevor Horn and ZTT Records is proud to announce the return of The Buggles, live on stage for their first ever full live gig… a mere 30 years after their international #1 hit single “Video Killed The Radio Star” kick-started a generation of electronic pop. Trevor Horn will reconvene the original Buggles line-up, including Geoff Downes (Yes, Asia) and Bruce Woolley (Camera Club, Grace Jones), to preform their ground-breaking début album “The Plastic Age” in full. No tour is planned, no DVD or live CD will be released. The Buggles, along with some very special guest artists, will perform live on stage for one night only on 28 September 2010 at at a special and intimate West London venue. This unique event is being put together to raise funds for London’s Royal Hospital for Neuro-disability. Active since 1854, the hospital has a simple but very important mission: to add years to life and life to years. Further details – including surprise guests, support acts, and pre-show exclusives – will be announced soon.